How Big is My Unborn Baby? That is a model of a foetus at 20 weeks gestation. We often show it to the expectant parents who come to us for a scan, and almost without exception, they're always surprised to see how small the baby still is at that point. By 20 weeks, the mother's 'baby bump' is usually becoming fairly pronounced, and if you've ever been present during a 3D/4D scan, you'd be forgiven for thinking that babies are rather large indeed by that stage! Watching your unborn baby on a big TV screen tends to make them seem larger than they actually are! Many an expectant mother has asked us how big her baby is at X weeks, and so we thought we'd put together a handy guide to baby size and how it changes from conception to birth. We hope that this will give you a clearer idea of your little darling's current size! ...4 weeks? Less than a twentieth of an inch long and less than a twentieth of an ounce in weight. At this point, your unborn child is just a tiny embryo, no bigger than a poppy seed. ...8 weeks? About 16mm (0.63 inches) long, or roughly the size of a single baked bean. That's more than fifteen times larger than the 4-week-old embryo, although the baby's weight has barely changed since then - we're still talking about a small fraction of an ounce at this stage. ...12 weeks? 2-3 inches long and about half an ounce in weight. You're currently carrying a foetus that's more or less the same size as a lime. ...16 weeks? Just under 5 inches long and about 3.5 ounces in weight. You're now in your second trimester, and the baby is about as big as an avocado. ...20 weeks? 6 and a half inches in length, 10 and half ounces in weight. At this stage, your foetus is a mite shorter than a carrot but weighs quite a bit more. ...24 weeks? Roughly 12 inches in length and somewhat over 1 pound weight-wise. Your unborn baby is growing quite rapidly now, and their current size is roughly similar to that of a 500ml bottle of water. ...28 weeks? By now, your baby should measure about 15 inches and weigh a little more than 2lbs. Picture an aubergine and you won't be too far off. ...32 weeks? Nearly 17 inches, with a weight of around 3lbs 12oz. Remember how, at 24 weeks, your baby was about the size of a 500ml bottle of drink? Well, now he or she is closer to a 1.75 bottle. ...36 weeks? 18.66 inches - that's just over 47cm - in length, and the best part of 6lbs in weight. By now, your baby is roughly the size of a melon. ...40 weeks? Now that you're almost ready to give birth, your baby likely weighs 7-9lbs (although this varies quite a lot) and measures between 20 and 21 inches. 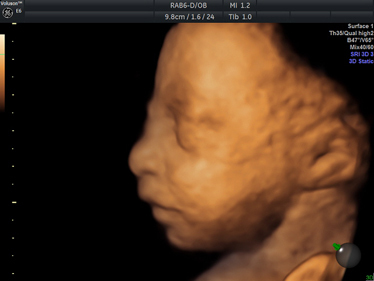 If you'd like to take a closer look at your unborn baby, click here to browse the 3D/4D scan packages available at your nearest First Encounters Ultrasound clinic. If you've recently become pregnant, you're probably wondering what's in store for you over the next 9 months! To make sure you have all the details you'll need throughout your pregnancy, we've made a week-by-week list of all the most common pregnancy symptoms. Please note that every pregnancy is different, and some people may experience certain symptoms earlier or later than others (if at all), so please don't worry if your own pregnancy doesn't perfectly match the list below. This is a very common time for women to find out that they are pregnant. This is a very early stage, so don't be surprised if you aren't experiencing any pregnancy symptoms just yet. Fatigue - Your body is embarking on a journey that requires a lot of energy, so even at 5 weeks, you may develop a sudden fondness for naps. Frequent Urination - At 5 weeks, your kidneys are beginning to expand, so you might find yourself making more trips to the loo than usual! You're almost two months in, and it's probably starting to feel a little more real. That being said, it's not unusual to have few (if any) symptoms at 7 weeks - remember, it's still relatively early in your pregnancy. Acne - Your hormones are all over the place right now, so breakouts are completely normal. Just make sure you check with your doctor before using any skin treatments to combat your spots. Nausea - The dreaded morning sickness! In spite of its common name, the feeling of nausea can sadly strike at any time of day. You may experience just a touch of nausea, or you may actually vomit - in either case, this is a common side effect of pregnancy at around 7 weeks and probably isn't anything to worry about. Headaches - Your hormones are still surging, and this can lead to headaches (which can also be brought on by hunger, dehydration and exhaustion - so make sure you're getting plenty of food, water and rest). Nasal Congestion - This is perhaps one of pregnancy's lesser-known side effects. By this stage, you may well notice an increase in your body's mucus production. Breast Tenderness - Your body is prepping for breast feeding and blood flow to this area is increasing, often leading to breast tenderness. Dizzy Spells - Those pesky hormones - particularly when coupled with changes in blood pressure - may cause you to feel dizzy. Make sure you sit down or rest during dizzy spells, and always eat/drink regularly to keep your energy up! Pelvic Pain - As your uterus expands, you may experience some aches and pains. It is best to avoid any heavy exercise and be thoughtful about how you position yourself - you don't want to put any unnecessary stress on sensitive regions. 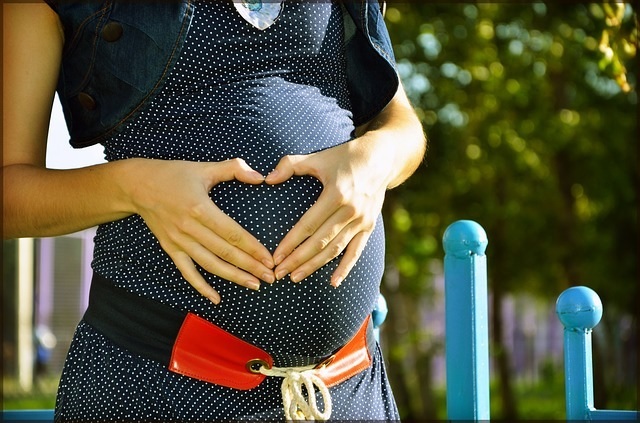 As you head into your second trimester, your pregnancy symptoms should become less erratic. Now you can look forward to your bump getting bigger and the baby starting to kick. You will probably continue to experience some aches and pains, and you should continue to go for regular check-ups to make sure that you and your baby-to-be are both healthy. 13-15 Weeks Pregnant: This is generally the point at which you'll need to purchase maternity clothes. Of course, you may want to buy it earlier just for the comfort it provides! 20-25 Weeks Pregnant: It's around this time that you'll start to feel your baby kicking. Again, every pregnancy is different, so don't worry too much if you have to wait a bit longer. 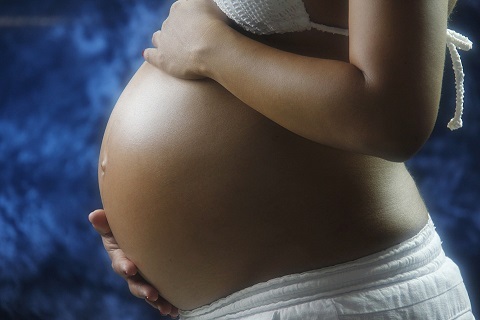 Approaching Due Date: Few women actually give birth on their exact due date. Nonetheless, it's an important date, and its passing signifies that your new baby will be with you very soon! If you're 8-13 weeks pregnant, why not book an earlyAssure™ scan with First Encounters? We also offer 3D/4D scans for when you're a little further along and you're ready to see what your little one looks like! Our clinics are located in Bristol and Cardiff.